The legal battle over the ancient bones of Kennewick Man has been won by the scientists, but they now face a new wrangle over access to the remains. The 9,300-year-old skeleton is among the most complete specimens of its period known from the Americas. Four Native American tribes that sought to re-bury the bones have announced they will not be taking their fight to the US Supreme Court. But they still regard the skeleton as an ancestor and call it "ancient one". The Nez Perce, Umatilla, Yakama and Colville tribes filed a claim to the skeleton shortly after it was unearthed on 31 July, 1996, on a wide bank of the Columbia river at Kennewick in Washington State. However, they were quickly challenged by scientists who said the skeleton could provide valuable information about the early settling of the Americas. In February, the coalition of tribes lost their legal fight in the federal courts to scientists who want to study the remains. The San Francisco-based Ninth Circuit Court of Appeals ruled that it was impossible to establish a relationship between the Indian tribes and "Kennewick Man". An attempt to have the decision reviewed by a panel of judges was also rejected. The defendants had the option to continue the fight in the US Supreme Court. But neither the tribes nor the US Justice Department filed an appeal to America's highest court by the Monday deadline. However, legal representatives for the scientists are still locked in discussions with the US Justice Department over what the researchers are allowed to do with the bones. Attorney for the scientists Alan L Schneider told BBC News Online: "We feel that they are improperly interjecting themselves into the purpose for which we can study the skeleton and the types of studies that would be appropriate to achieve the objectives." The government has said that it would not permit any chemical or invasive testing on the bones. This would scupper any further attempts to obtain DNA samples from Kennewick Man. The discussions are also likely to cover the question of how access to the remains is controlled. "They're saying you have to restrict your studies and only a couple of people can go in and look at it and that sort of thing," Professor Robson Bonnichsen, one of the lead scientists, told BBC News Online. The plaintiffs are also concerned by suggestions the bones may have deteriorated in the eight years since they was pulled from the sediment. "The government has now come up with all kinds of concerns - that the skeleton is in such poor condition. The condition's changed under their watch because everyone said it was in great condition when it came in," explained Professor Bonnichsen. "We know that the number of pieces of skeleton have grown since they've been there lying in the cabinet," he added. Three tribes decided not to appeal the case before the weekend. The Umatilla held out to the deadline, but said in a statement on Monday that it would not proceed with the case any further. "The decision was based on the availability of financial resources, the uncertainty of whether the Supreme Court would even hear the case, and the risk that an unfavourable Court decision could become law," the statement read. It added that the Umatilla's board of trustees would begin working with other Native American tribes on a strategy to amend the Native American Graves Protection and Repatriation Act (Nagpra), the law enacted in 1990 to protect tribal burials. "Nagpra needs to be strengthened so that it fulfils Congress' original intent, which was to protect tribal burials and return sacred items to the tribes," said Armand Minthorn, Umatilla board of trustees member. The bones of Kennewick Man are currently held at the Burke Museum in Seattle. Indians in America are deathly afraid these bones will be of some other race other than their own. If the first inhabitants of North America were shown to be Whites, then the Indians would lose their moral high ground as the preservers of the American environment and be subjected to claims that their ancestors killed off the origianal inhabitants of America. A set of ancient skulls unearthed in central Mexico's Teotihuacán Valley, found at construction sites in the rapidly growing Mexico City region, are rewriting the history of human colonization in North America. Geologist Silvia Gonzalez of Liverpool John Moores University in England recently analyzed four of the skulls with help from colleagues at the National Museum of Anthropology in Mexico City, where the bones are housed. She was amazed to find that one of them is 12,700 years old, 700 years more ancient than any human remains ever before found in North America. That skull, known as Peñon III Woman, has a long, thin shape, dramatically unlike the short, broad form of previous Mexican remains and of today's Native Americans. Most anthropologists believe Native Americans are all descended from a single population that arrived from Siberia. But the Peñon III skull, along with others in the museum collection, does not seem to be related to the Siberian travelers. Rather, they resemble Japan's indigenous Ainu people. Gonzalez believes relatives of the Ainu were part of another, previously unknown wave of immigration that originated in Japan, swept across the Bering Strait, then moved down the west coast of North America and into central Mexico. Anthropologists have found remains of one modern narrow-headed population, the Pericus, that lived in Baja, California, until going extinct in the 18th century. Gonzalez plans a return trip to Mexico this month to collect DNA samples from Peñon III Woman. She will compare those samples with DNA from Pericu bones to see if the two populations are related. "We need to discard the hypothesis that it was just one massive migration into America. The picture is much more complicated," she says. turn out to be more than 12,000 years old. Photographs courtesy of National Museum of Anthropology, Mexico. What can you tell me about Kennewick man? Was he Europoid? Was America inhabited by whites before the mongoloid inmigration? There is some good information in these threads related to what you ask. A whole e-book on the subject of proto-Caucasoids and also proto-Negroids in early America. Don't let them bury our European heritage. U.S. Heathens are still fighting the battle for the preservation of Kennewick man! Go to the bottom of this link. This is the work of Steve McNallen and his group. I have corresponed with Steve. Steve is an engineer and probably a great engineer but he is not an anthropologist. 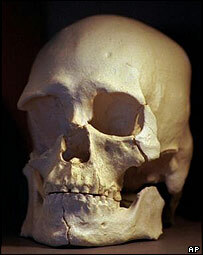 The Kennewick skull does not look like a modern Indian but neither does it look European. It may look somewhere inbetween and be an archaic East Asian, an Ainu or something similar to that. If someone could post a picture of the skull, perhaps we could type him ourselves.